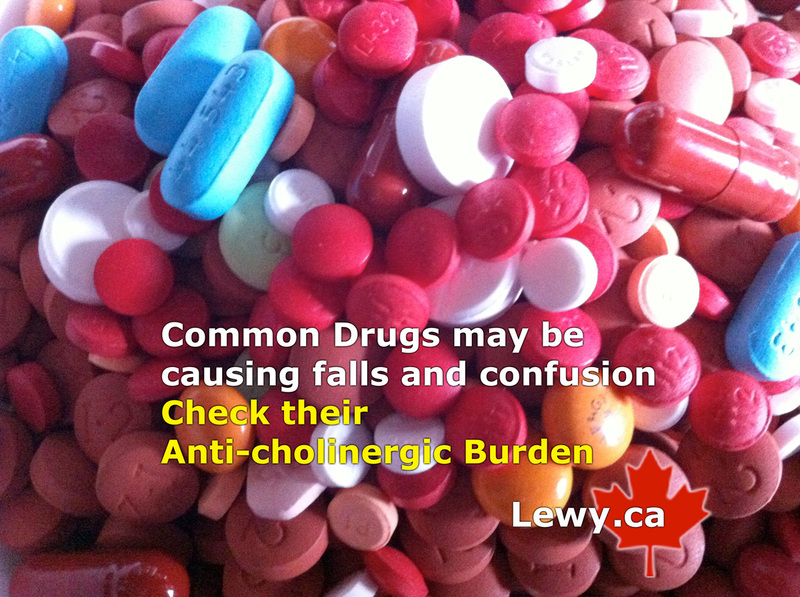 Many common drugs for a vast range of ailments can contribute significantly to confusion, dizziness and falls, any of which can also to lead to death. People living with Lewy Body Dementia may have medications that could be adding significantly to the already-difficult symptoms. This can drastically reduce quality of life, and that of their carers. These drugs have what’s described as an Anti-Cholinergic Burden (ACB): they diminish or obstruct the effectiveness of acetylcholine, a neurotransmitter, in the brain. Common anti-depressants, anti-allergics, and medications for Parkinsonism, incontinence, and many more conditions can have dangerously high ACB scores. The cognitive effects of the ACB from many medications has been known since 2008 or earlier. However, drugs with these properties are still regularly prescribed, and their ACB effects may not be taken seriously enough, particularly for those with other cognitive challenges. A simple, online anti-cholinergic burden “tool” can calculate the risk for you. Just type in the names of the drugs, and it will calculate the ACB and provide a score, which you can use to inquire whether these medications should be continued, or whether there’s an alternative. Try the Anti-Cholinergic Burden Calculator. Drugs are frequently prescribed for a specific condition, but the condition is not always monitored. This is especially true when the person goes to multiple doctors. It may be that the medication is no longer needed. Many people with complex medical conditions are subject to “polypharmacy,” where the simultaneous use of multiple drugs are used to treat a single ailment or condition. Keeping on top of this, in addition to the ACB is a potentially life-saving, and quality-of-life improving strategy that should be carefully assessed, always in consultation with a medical professional. For more information, download these useful guides, and visit these pages about Anti-cholinergic burden. Author’s note: Several years ago, I’d personally researched ACB, and found Aging Brain Care’s ACB brochure. Once investigated, I asked for one medication to be stopped because of it’s ACB ranking. The person living with Lewy Body Dementia’s doctor approved this drug being stopped, although skeptical it would make any difference. We found that the results of stopping this drug were very beneficial, with a significant, noticeable improvement in cognition. Stopping the drug made no difference at all to the incontinence issues for which it was originally prescribed, many years previously. Although it is possible the drug might’ve been somewhat effective initially, any beneficial effects had long since ceased.